I'm going to transition out of the two-in-a-row salted chocolates with a salted toffee chocolate this week. 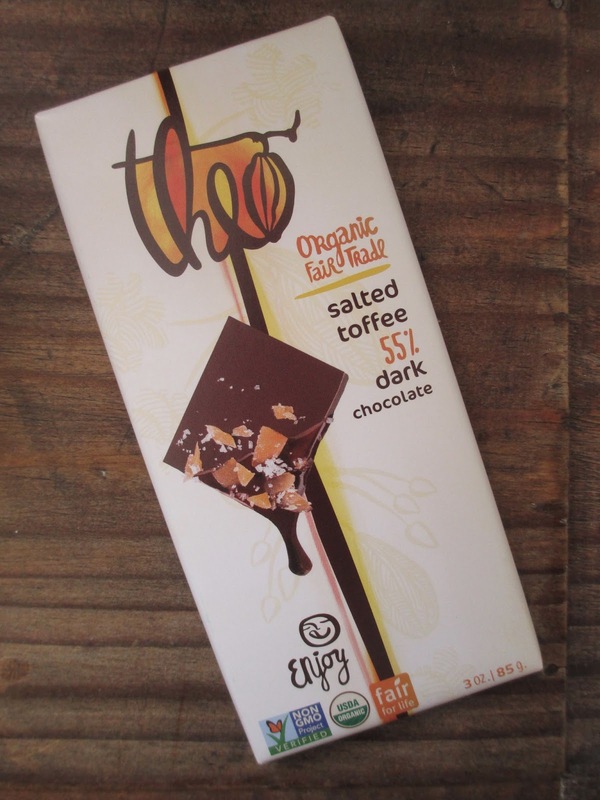 It's Theo's 55% Dark Chocolate Salted Toffee. As you probably know, Theo uses organic and fair trade ingredients, making them acceptable under my new (or maybe I should say "more fully self-enforced") standards. I also generally enjoy Theo's chocolate, milk and dark and flavored and plain. On first look, I expected this bar to be pretty similar to the Nutcracker Brittle bar that I reviewed a couple of Christmases back. In many ways, it is related, but there are a couple of key differences. The Nutcracker Brittle was 70% cocoa instead of only 55%, that one hard plenty of hazelnut shards in it, and it also had more salt (which I know because I have some of that same Nutcracker Brittle left from this past Christmas, so I'm able to compare these two side by side). It's harder to say whether the "toffee" is the same thing as the "brittle," though they do appear the same to me. They both have that light sugar crystal crunch that I compared last time to rock candy. It's a nice crunch, and without the hazelnuts in this bar you're able to focus more on these little pieces of sugar crystals. There is some taste here and there of salt, in some places more than in others. The salt is definitely more of a companion piece or an accent, as the name implies; the emphasis there is on the toffee rather than on the salt. As with the Nutcracker Brittle, this is a bar that you have to chew on because of those little pieces of toffee in there. I think that, as far as the chocolate goes, I prefer the 70% to the 55%, but it's still basically the same chocolate, just . . . a little more watered down, if I may. It's hard to say that it's sweeter because it isn't really that sweet and it's hard to say that it's not as dark because the 70% isn't really that dark. It's just lighter; let's go with that description. If I might point out here, as well, Theo has set up a 55% dark chocolate that I'm neutral toward, instead of my usual negativity toward with cocoa percentage. 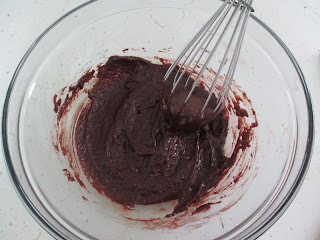 This chocolate has a sort of rich flavor to it and a smooth mellowness that is unlike that thick, almost syrupy taste that's normal in the 50's range. I let a corner that had very little toffee in it melt in my mouth just so that I could test the chocolate's taste on its own, and it was able to stand on its own. Given this lower cocoa content and the candy-bar-like inclusion of sugar crystals, Theo could make a miniature version of this bar if they wanted to try a different marketing angle. Even like this, it's something nice to reach for when you want a munching chocolate, when you're maybe craving something slightly sweet but not too much. Something to keep in your desk, maybe? Almost three years ago, when I saw Belle, I described the film as being like "a piece of a person's life." (Click here to read that post.) Coming from director Amma Asante's latest film, A United Kingdom, I see that same stylistic fingerprint that I found so refreshing in Belle. Unfortunately, A United Kingdom is one of those smaller release films with multiple release dates--so I thought for a moment that I might not be able to see it. In Arizona, you can currently see it at the new Harkins Camelview over at Scottsdale Fashion Square (which, by the way, is a very nice theatre). Anyways, because perhaps not everyone has heard of this film yet, I'll provide a basic summary. It's a love story between a man named Seretse and a woman named Ruth. The details: it's 1947, he is about to take his role as king of Bechuanaland (present day Botswana), and she is white and British. They decide to get married because they love each other and they've resolved to overcome any issues that might come up. But the issues quickly become as much political as racial, and they're caught up in so much more than they had ever imagined they would have to deal with. It's that very progression that works so well in this film. The early scenes are stripped of political and racial connotations. A man and a woman meet at a social event and immediately grow interested in each other. They meet again. They go dancing. They talk. They walk around at night talking. It's very intentionally just two people falling in love in the usual way. Then the scene starts to change up a bit--once again in the usual way. A couple of issues start there in England because Ruth and Seretse are an interracial couple and this is 1947--again, though, this is expected, by both the characters and the audience. Not that they don't mind it, but this is what they know is coming, right? Once they're married and they go to Bechuanaland, there are similar issues, only in reverse. This time it's Seretse's community rejecting Ruth, which she didn't really expect or at least not to this degree. And as I said, these issues soon escalate to (or perhaps I should say switch to) political issues. Here's the thing. Ruth, in this film, is just a woman. Her characterization is carefully controlled. We know that she had a job but we don't know why she has that job or how she felt about that job or anything like that. We don't see any of her friends in England, just her parents and her sister. So there is no indication that she is someone who would have chosen to be in a political situation, or that she wanted to be in a social environment where she would have to adapt--nothing like that. She's not characterized as being the nicest woman on the planet--she's nice, yes, but that isn't supposed to be the point of her character. The point is simply that she fell in love with someone and she kept her word to love him and stand by him and to, by extension, love and stand by his country and his people. She makes adjustments and gains the respect and love of his people because she decides to do her part in making this union work. Seretse's characterization matters more, of course, because as a ruler, he is political and he was raised to be political. He knows that his choice to marry Ruth will have political effects, but he also considers this a personal decision that he should be allowed to make on his own. Further, in the way that he sees it, this marriage can have a positive effect on the socio-political scene of his country; he wants equality and he sees acceptance of this marriage as a step in the right direction. It's like when he explains why he's going to the film screening even though, as king, he is the only black person allowed to go; he says he goes out of defiance and out of the hope that things will be better someday. Seretse is smart. He knows what issues belong to which category and he can see from where exactly conflict derives--and he in turn uses that awareness to try and improve everything. He sees how things are and why they are and how they could be and how he hopes for them to be. Amma Asante, as a director, has the ability to portray the personal side of political situations. There is the sense of daily life, daily people, and daily choices to this film, as was also the case with Belle. People who are just trying to live their lives in the best way that they can see. People who see things in a straightforward way and have the world tell them that, no, it isn't so simple, you can't do things this way or be this way because we won't allow it. People who take those obstacles and look at them and elegantly overcome them--for personal reasons and so that other individuals can live better because the road is being paved for them. That elegance is what I responded to so much in both of these films. Sure, it's exciting to watch films that show the defiance that led to social reform. But remember all my talk lately that I don't like rebellion for rebellion's sake? Sometimes with films that focus so much on the defiance, I feel like we're focusing too much on rooting for people talking back to others when the point is supposed to be finding a way in which we can all work together. So we have to start in looking at our daily lives and seeing how we are or aren't doing that. My final note is just to say that I encountered in this film a bit of history that I knew essentially nothing about. I don't know how it was for everyone else, but my world history classes consisted of the Fertile Crescent, Ancient Egypt, the Roman Empire, Medieval and Renaissance Europe, and the World Wars--and little if anything else. I feel like I've learned more history from my literature classes than from my history classes (okay, yes, I've taken more literature than history classes, but even in high school). At one point in the film, Ruth is asked if she knows the word apartheid. I didn't know it until I took Holocaust Studies my junior year of high school--and even then, there was only so much time to learn about everything connected to this . . . one word. So I'll just take a moment to appreciate that A United Kingdom was a film I could connect to on a personal level while also being a film that showed me places and situations and history with which I was entirely unfamiliar. I hope I haven't talked too much about the plot of this film. My point is, go see it if you have the opportunity; it's wonderfully done. And especially with the types of running conversations relating to politics and socio-politics that I've been hearing lately, I wonder why more people aren't getting excited about this film and talking about it. I guess this is just my week for long, rambling posts. Apologies. If you've only been to Symphony Hall in downtown Phoenix once, chances are it was for a Christmastime performance of Ballet Arizona's The Nutcracker. They put on a wonderful performance, with many, many shows each year--and it's supposed to be one of the best productions of this ballet in the nation. I can see why: the dancers are talented, so many elements are timed to perfection, and the sets and costumes are detailed and beautiful. So if this is the one event that brings people to Symphony Hall or to go see a ballet or to hear the Phoenix Symphony live, then that's great and I'm certainly not complaining about that. I'm just wondering about something. The plays draw people for different reasons. A lot of retired people. A lot of college looking people who are probably seeing it for a class or because they're feeling particularly cultured and educated right now and therefore going to see a play feels like the thing to do (and because they get tickets for the price of an IMAX movie). So a quieter, more niche group. The opera, as I mentioned before, brought in the classy people. You can tell when there are people with money in the room--people who are letting that money show a bit tonight because it's the opera and they wanted to dress up and they paid hundreds of dollars for their tickets. Other people really want to be there and are really excited to be there because they really enjoy the experience of the music and the singing; so these people, given that they've probably been planning this night for a long time, also put a lot of thought into what they were going to wear. Maybe they even went out and bought a new dress. In general, they're artistic people with taste--so that shows in what they choose to wear. Simple elegance. I'm not saying everyone was wearing diamond tiaras or that I think everyone should have been; I'm just saying that everyone, in their own way, put themselves together for this night. I want to try and guess that the age range was more around 30's through 60's for this one. Not as many white-haired heads in the crowd, and also not quite as many very young faces. Now, when you go see The Nutcracker, you get quite a variety of ages and types of people, and it was pretty much the same for Romeo and Juliet. Maybe not quite as many families this time, but still a similar scene. There were children sitting in the seats near me ranging from probably about nine years old to fifteen. Still plenty of adults, ranging from the very young to the less young to the more mature and so on. People who looked monied. People who looked like they just really wanted to come see this show. People who looked artsy. People who didn't. The dress style? Much less formal and therefore a bit less elegant. More like "church clothes." Whatever you have in your closet that looks presentable. (I feel like I'm starting to sound borderline rude here. I don't mean to say that you should only go see a show if you buy a new outfit; I certainly didn't do that. Nor do I mean to suggest that clothing is the only thing that matters.) Basically what I'm getting at is that the crowd was more varied at the ballet than at the opera, and I'm wondering why. I know that people make fun of opera, in a way, and most people can't imagine going to see opera. But people kind of make fun of ballet, too. So why do more types of people consider going to the ballet than to the opera? I enjoyed the ballet, but I vastly preferred the opera; it was in fact the opera that held my attention more and moved me more. I know everyone won't feel the same way, and of course our reactions also vary depending on the particular opera or ballet that is being performed. But here's the thing. Music, singing in particular, resonates with people on a deep level. This is why you can listen to a song in another language, without knowing what it means, and feel what the song is saying and what the singer is portraying. Dance resonates, as well, and of course there is music to dancing. But if modern people don't listen to much opera, they also don't listen to much symphonic music. So I would imagine that most people who aren't musicians who are going to a ballet are seeing more of the dancing than the music. And dancing is fascinating to watch. The choreography, the athleticism, and the emotion of movement. It is wonderful, yes. But for me, it was easier to focus on the emotion of song for over two hours than the emotion of dance. In general, I enjoyed the group dances more than the pair dances, even though I felt like my favorite parts should have been the dances between Romeo and Juliet since it is their story. The fight scenes were probably my favorite; I had never seen ballet sword fights before. I guess I mainly liked when there was more to look at, more places for my eyes and my head to wander. And maybe that's why some people would sooner go see a ballet than an opera. I didn't like my mind wandering; when I lost focus, I took that to mean that I wasn't enjoying the show as much as I might have liked to. I said that the opera took my full attention for all of its duration--but that was because the music touched me. And if other people feel like they won't be touched by the music of opera, then when their attention wanders they won't have much else to focus on. The singing is the star of an opera. Some attention goes to costumes and sets and I guess some operas have more choreography to look at. But the two operas that I've seen have had a much simpler stage than the elaborate productions by Ballet Arizona (I said I wasn't doing a reaction post, but I have to add in here that the backdrops to Romeo and Juliet were absolutely gorgeous, and I loved all the dresses). When your mind wanders at the ballet, there are multiple things to focus on. When your mind wanders at the opera, there is less. This is why the audience crowds differed. There were more types of people at the ballet because they were there for more reasons. The opera crowd was mainly there for one reason: we knew that we would be moved by the singing. Some perhaps because they grew up with the "culture" of fine arts and don't see opera as a foreign genre, and others because they discovered later on that this music speaks to them. I'm beginning to understand this much: performance is art. When I go to the art museum, I spend most of my time looking at the European and American art from medieval times through the 19th century; I walk into the modern rooms only to quickly walk out again because the art there doesn't speak to me, even though I see people there who are mesmerized. Performance is the same way. We all find what speaks to us and realize that we prefer certain things over others. The main thing is to go ahead and look. Walk into the modern art section just to see if it speaks to you. Go to the opera just to see what it's like. If it doesn't speak to you, then that's okay; find what does. But it's fascinating to see all the many reactions we can all have to the same piece of art and the ways in which we settle on the art that we're comfortable with. Warning: this post is a rant that probably runs lengthier than it needed to. Basically I'm only speaking on this film because I looked at some of the critics' reviews of it, and I don't quite understand why they all seemed to give it two thumbs down. I in fact enjoyed The Space Between Us, and while I'd agree that it wasn't the best movie ever made (which of course not all movies need to be in order for them to be enjoyable), I find some of the critics' comments unfair. The main point is sentiment. Sentiment is a weird word since it can simply refer to emotions or it can refer to excessive focus on emotions. Critics complained about this movie being too sappy, for including a teen love story and for including tragedy. (Odd enough, they criticized its tear-jerker status while I did not consider this movie a tear-jerker at all. I thought it was more of a power message. Just because a character might die in a story doesn't mean that that story is necessarily sad.) Here is my question: what is wrong with portraying emotions in fiction? What is wrong with sentiment? It seems appropriate here to mention that I don't care at all for films like The Notebook. I find those boring. And I can only watch the standard Hallmark movies if I'm really trying to avoid doing something else. So it isn't as though I have a history of enjoying the mass-marketed sappy material of fiction (I don't read much genre fiction, either). But I don't think that The Space Between Us was the standard mass-marketed YA love story that the critics were all complaining about. The trailer certainly made it look like a YA love story. But I'm not convinced that it was (this could lead to an entire conversation about what it means for something to be YA). My main reason for this is that I don't think the film is from Gardner's perspective (or Tulsa's). He's the main character, yes, but the perspective of what you come away with after the movie is over pertains more to Nathaniel Shepherd's perspective and somewhat also to Kendra's--that is, the two adult main characters. Sure, there are some nice little sequences of Gardner's wish to visit Earth to be around people his age and then of him being so thrilled about every little thing that he experiences on Earth. I don't find it necessary to ignore the sweetness of the way in which he falls in love with Tulsa: fiction, even teen-centered fiction, rarely shows the sweetness of love. Passion, yes. Newness, yes. But sweetness not so much. Gardner's love is sweet and innocent and altogether positive, and that's refreshing to see, as is his general optimism toward life and toward every person that he meets. I'll take this moment to appreciate Asa Butterfield's acting skills; even the critics couldn't ignore all that he was able to do with this role. However. Despite Gardner leading the film in many ways, the story comes down to something more than a teenager wanting to become part of a community of peers. 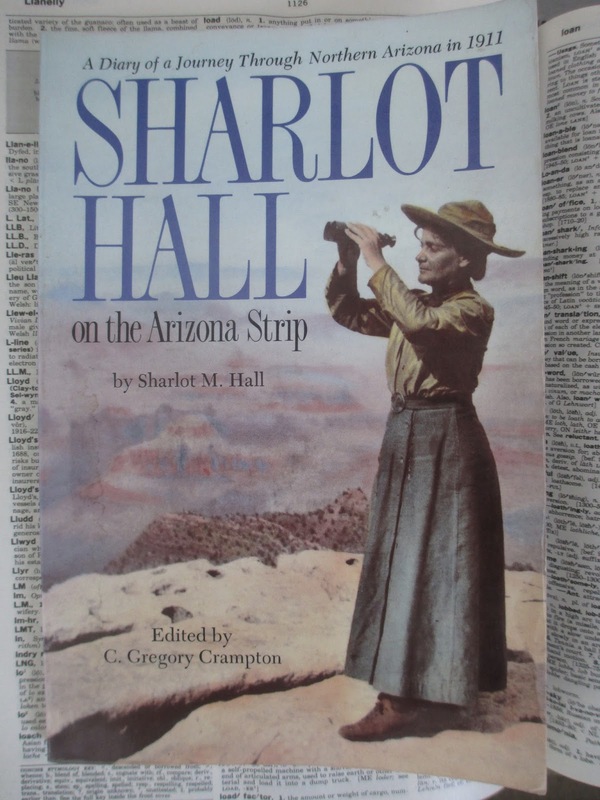 It's Shepherd's story of the vision that he had--and of the unexpected detail that came in and threatened to destroy or at least forever change that vision. He tries to flee the truth for many years, to flee what he must do--but in the end when all the pieces fall in and he stops fleeing, he is relieved and even glad. Kendra has a similar story on a lesser level. She's trying to move on with her dreams after something happened to bring the potential for sadness--and along the way she discovers a new focus to bring her joy and fulfillment. So the heart of the film (sorry, I couldn't resist throwing in that phrase) is in fact how the adults come to terms with certain aspects of their lives, set against or in terms of their relationship with the two teenagers. I enjoyed this movie because it was fun to watch, the actors were good, and it made me think about the human condition. About living, about relationships between people, about how much we give back to the world that gives us what we have and what we experience. I didn't love it for the love story because the love story was only one almost small aspect of the film--and even it was more important because of what it said about Gardner and Tulsa as individuals rather than as two people falling in love. And parent/child relationships were more central to the film as a whole than romantic relationships. So you know what? There is nothing wrong with film portraying the sentiment of various types of human relationships--because these are often the most important aspects of life, and art explores life. Sentiment or sentimentality? I guess one calls something sentimentality if it is sentiment that one prefers not to dwell on. One person's sentimentality can simply be another person's sentiment. You know how locals usually don't find themselves in the tourist areas very often? That's how it is for me and Old Town Scottsdale. There are a couple of shops there that I like, but I don't have the need to visit them too often. I used to love eating at Distrito at The Saguaro Hotel--they had some of my favorite food but regrettably it was always empty there, so they closed last year (there is now a new restaurant at the hotel, but it isn't at all the same). 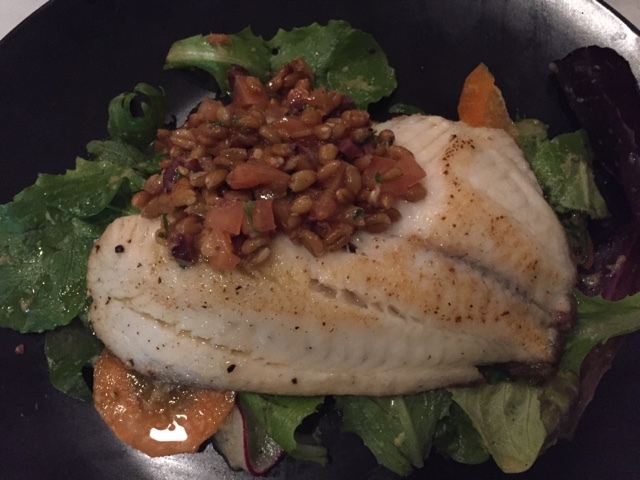 So when a couple of us found ourselves headed to Old Town Scottsdale looking for somewhere to have dinner, we had no idea where to go, despite knowing the names of several restaurants there. You see restaurants while driving by but you don't necessarily ever go to any of them. By chance, we ended up walking down Main St. and we saw a sign for Nonna Urban Eatery. The name sounded promising, so we went to look at their menu, which also looked promising. This is the sign that led us toward the restaurant, but I took this picture another time (during the day). 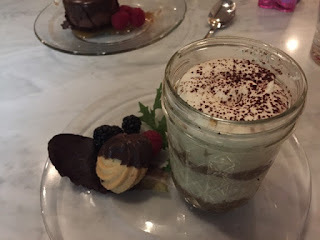 On learning that this is a new restaurant (they hadn't yet had their official opening when we were there this past weekend), I felt similar to how I did visiting Moscato in Camp Verde back when they first opened. There's something special about being there to see the beginning of a promising restaurant. But it's Scottsdale, you say? Surely there must be plenty of good restaurants. Yes, there are. But there are also plenty that I don't care for and many that I'll eat at but won't get excited about. I like restaurants that serve food, and sadly that can be hard to find. Sometimes these days the restaurants with more natural foods also have a "healthy style" and I don't want kale wraps or sweet potato fries. 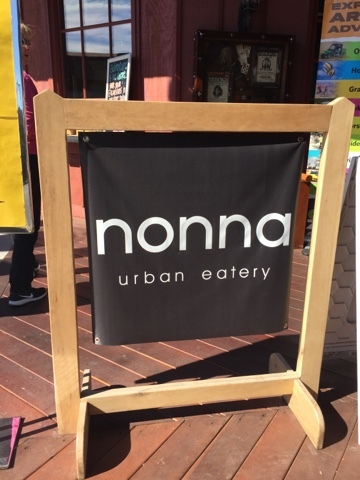 Nonna is more hip and adult, less trendy-rustic. They have a selection of wines and such and their plates are small, giving, well, the urban feel. This is a place where you can go to spend time and a place where you will enjoy every aspect of your food. 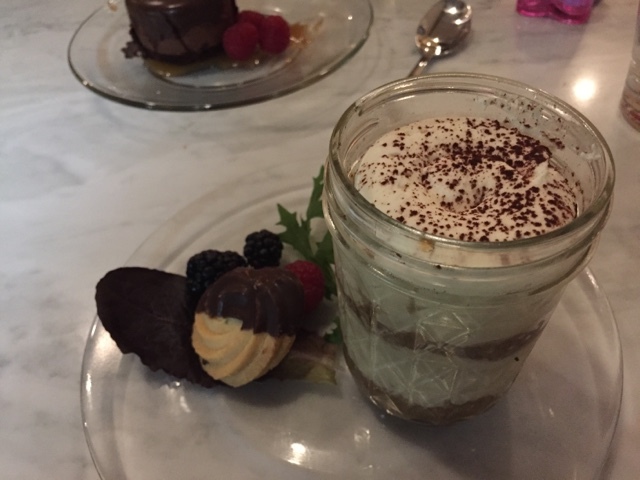 Iced tea, tilapia, and a taste of both the chocolate cake and tiramisu. These are all simple dishes, foods that I've had before. But in this restaurant they were all unique and all full of flavor. Chef Gian Franco Brugaletta, according to the restaurant's website, seeks "to bring back simple, nutritious food, through traditional and creative flavors." This is exactly what excites me in food, and this is why I immediately felt at home in this restaurant. I don't need dishes that I have to Google or dishes that required advanced chemistry to make. Just give me food made with good ingredients that you have formed in a way to make the flavors dance. That's exactly how the tilapia was. Tilapia is a light fish, so it already tastes nice even if you don't do much with it (I've made it with very bare seasonings when I've made it at home). But here the seasoning added so much flavor and together with the side accompaniments, this was a unique dish that I wouldn't have been able to put together myself and that I wouldn't come across in a restaurant the next street over. There is art in this kind of simplicity, where "simple" doesn't mean boring or lacking in detail. As usual, this isn't a review. It's a reflection on how satisfying it is to find a restaurant that does so well with its food. This is food that I would (and do) look forward to returning to. Given that they use seasonal ingredients, there will probably always be something different to try. Just note that they currently close for Sundays and Mondays. Go there during the week or on a Saturday for fresh food and a stylish atmosphere. Can I officially say now that I love the opera? Don Giovanni at the Santa Fe Opera last summer was my first opera and I enjoyed that immensely, and now I've also seen Madama Butterfly here by the Arizona Opera and it was absolutely amazing. Let me start with one superficial note. Arizona Opera's website explains that the opera is the place you can get all dressed up for, and I love that this is true. I like the concept of dressing up. I grew up watching things like I Love Lucy where everyone puts on their best clothing and takes all of this time to get ready to go out somewhere, be it dinner and the movie theatre or a show. Nobody really does that anymore, at least not here. Movie theatre? Casual. Nice restaurant? Slightly dressed up. A play? Almost casual. But Symphony Hall? Expect people to dress up, especially for the opera. The men who weren't wearing suits were at least wearing collars. Many women had full length gowns, and dresses ranged from classic black to a bit of glitz. (I went with classic black.) A little more glitz than in Santa Fe, where everyone paired elegant yet comfortable shoes with their black dresses rather than the more expected high heels. Either way, I love the dressing up. In many ways, Madama Butterfly was an entirely different production from Don Giovanni. That set was very sparse, while this one was filled in more with the Japanese house, a bit of garden, and a background showing the sea. The lighting, as well. I don't have such a photographic or cinematic eye that I notice lighting in any particular way--but I had never seen lighting done so artistically in the theatre before. The light produced the effects of night and day and different tones, as well as drawing attention to particular spaces. It was very beautiful. Whereas the subtitles in Santa Fe are attached to the seat in front of you, these are on a screen above the stage--which I thought wouldn't be as nice but in fact worked just as well. And you really do need the translation. Don Giovanni had more conversations and so you needed to know what the characters were saying to follow each scene, but Madama Butterfly is more about long songs that are poetic and flowery in their depiction of emotion. As you're listening, you're also reading these pretty words and so you're experiencing two art forms at once. The music of the two operas is also quite different. Madama Butterfly is by Puccini, with whom I thought I was entirely unfamiliar (except for "O Mio Babbino Caro," which Downton Abbey informed me was by Puccini). I can't explain his style in musical terms, but to me it sounds fluid and soft and elegant and piercing at the same time, like pink dye running over fresh silk. You might say that the music together with the lyrics are a little sappy in their emotional intensity--but I like that. In fact, a couple of lines that the audience found funny I thought were very sad and did not laugh at. While all of the singers were excellent, Sandra Lopez stole my heart (or my ear?) as Cio-Cio-San, or Madame Butterfly herself. Oh, the way she sang. Her delivery brought not only amazing musical sounds but also amazing emotion. I didn't know that the song "One Fine Day" was from this opera until its music began--and when Butterfly started singing the familiar lines I felt like I had never heard it before, because I had never heard it like this before and I had never known the context for the words. She broke my heart and I literally cried. Her innocent vision of hope when all the audience knows that her hope will not come true is unbearable. This opera made me want to weep. It was tragedy indeed. When the music stopped and the performers finished and everything came to an end, I had a genuine shock. I was so caught up with what I was watching unfold on stage that it was jarring to see an end and then to see the performers come out as themselves and to see that they're not these characters. It was so much like I was watching something real--because they did create something real and tangible. If you've never gone, go see an opera when you get the chance. It's an experience like no other, immensely powerful. You know what? 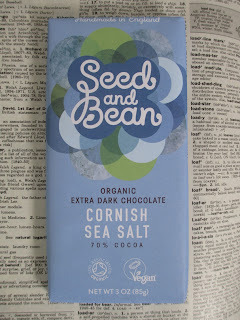 I think that it was the name of Seed and Bean that led me to look past their chocolate before. World Market's been carrying their products for I think at least the last year (while they keep certain brands in stock, usually the ones that they rotate in and out stay for about a year). "Seed and Bean" perhaps implied to me that this was a "healthy" bar filled with sunflower seeds and pepitas and maybe flax and chia or something strange like that. Such, however, is not the case. I suppose, then, that the name must simply come from the fact that we call cocoa beans beans when they are in fact seeds. And using "seed" in the name does give more of an organic sound to the name, which I'm sure is intentional. 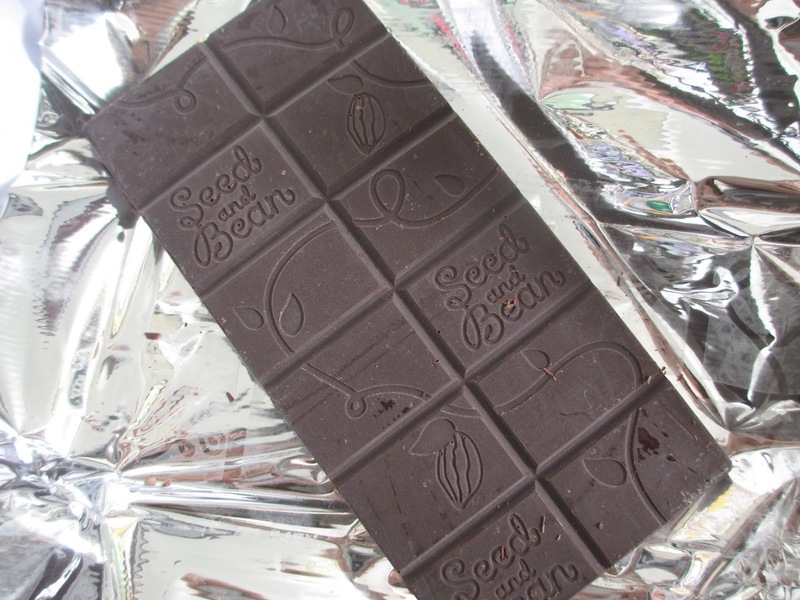 Seed and Bean is organic chocolate, and it carries the stamp of The Ethical Company Organization, which I had never heard of before. The inside of the paper wrapper further explains that they are the only UK chocolate company to receive 100% ethical accreditation from them. This means, they say, organic ingredients, fair deals to farmers, and respect of the rural environments. That all sounds wonderful. 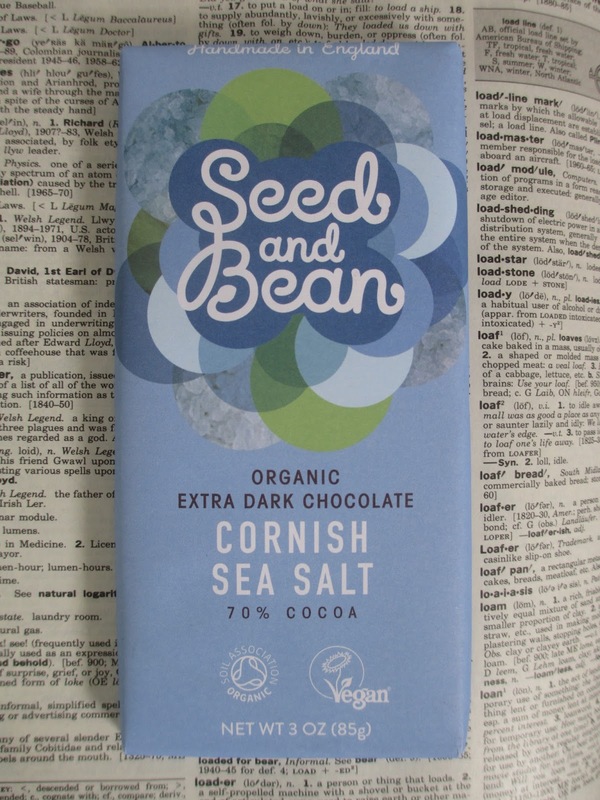 The bar that I chose is their Cornish Sea Salt, which is a dark chocolate with 70% cocoa content. The cocoa is sourced from Ecuador, and the salt is smoked Cornish sea salt. The simple packaging gives a handmade yet polished and up to date look. The "foil" wrapper is in fact cellulose, which the wrapper informs me is home compostable. This is a nice touch. Not only is it nice to have a material other than foil (foil is pretty horrendous, environmentally speaking), it's nice that you can compost this wrapper at home (not that I can personally have a home compost right now). Something that I bought recently made a big deal about having compostable packaging and then mentioned in fine print that it wasn't home compostable--tell me, where would you take such a thing for composting and who would go through that trouble just for one wrapper? Anyways, this cellulose foil is a little more like film, so it is true that you might go through more trouble trying to rewrap the rest of the chocolate--or you can just finish it all at once. Unfortunately, World Market (where I bought this bar) often sells chocolate with bloom. I don't know if it's because they keep old chocolate or because they don't always keep it at the right temperatures or simply because they sell chocolate that has been shipped from far away. The fact is, you really can't see how pretty this chocolate bar must have been when it was first made because it now has that unfortunately layer of bloom on its surface. But at least you can still see the nice cocoa vine that runs across the twelve squares. Reminiscent of some of the chocolate I've found at Trader Joe's, the aroma is fairly standard and simple with a sort of marshmallow hint to it. 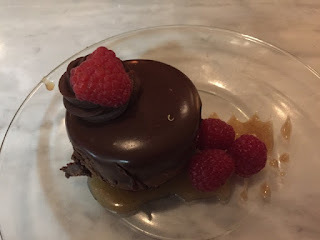 At first taste, the chocolate is a little bitter. Here I must note that this bar's best by date is already in August, which must mean that it's almost getting old--at least, the chocolate feels like it's getting old. It really isn't melting very well, and I've had to chew it a bit to get it to start melting, which unfortunately affects both texture and taste. Still, I have positive comments. That slight bitterness quickly fades and then the salt comes in. It's just the right touch of salt, and it's good quality salt, and it's spread all throughout your flavor experience. So you don't just taste it once all in one go: it appears and then fades and then returns. As such, you don't really get a good chance to taste just the chocolate on its own; what you can taste of it, though, is perfectly fine. It's rich and warm. 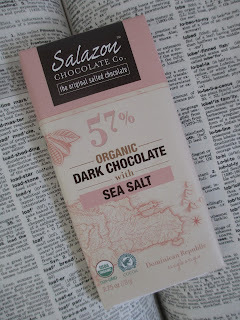 But this is flavored chocolate, so the salt is constantly working as the flavor companion. And, in fact, this is probably one of the better salted chocolates I've had. It's such a popular combination these days and yet it's one that you need to execute in perfect balance. And of course, if your ingredients aren't good quality, that'll come across. So I commend Seed and Bean for getting the balance and quality right. For ethics and flavor, Seed and Bean is going on my decreasing list of chocolate companies I'm allowing myself to focus on.